Oakland native Ray Carlisle explains historic agreement to Derrick Johnson, President/CEO, NAACP and Leon Russell, Board Chair, NAACP at their national Board Meeting in New York. NID Housing and the NAACP recently executed a five-year MOU to affirmatively address homeownership and wealth building in minority and low-income neighborhoods. Mr. Ray Carlisle, Sr., NID President and CEO, attended the NAACP Board of Directors meeting in New York City on February 16, 2019. Alongside the NAACP President/CEO, Mr. Derrick Johnson, and NAACP Board Chair, Mr. Leon Russell, Mr. Ray Carlisle Sr. spoke about the opportunity to serve minority neighborhoods with the NAACP. NID brings decades of experience advocating for equal access to homeownership products and services along with a passion for imparting an entrepreneurial spirit to its clients. Through access and information, NID’s and the NAACP’s clientele can rebuild family wealth decimated by the housing crisis. 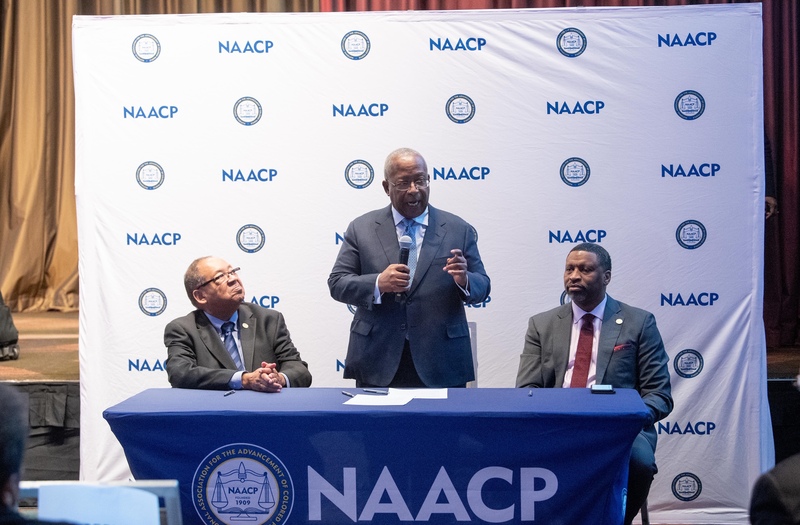 The National Association for the Advancement of Colored People (NAACP) and NID Housing Counseling Agency (NID) entered into a five-year Memorandum of Understanding (MOU) at the NAACP board of directors meeting held February 16, 2019 in New York City. The MOU is focused on the economic empowerment of African American families and communities; initially through access to knowledgeable fair and affordable home loan mortgage lending to foster the growth of quality homeownership opportunities for Black families. The African American and White wealth gap is presently the greatest in several decades; with ninety-five percent of Black wealth traditionally contained in the equity in their homes. The U. S Census Bureau homeownership rate statistics by race in the fourth quarter of 2018 reports the Black homeownership rate at 42.9%, for Hispanic 46.9%, Asian/Pacific Islander 58.1% and White homeownership rate at 73.6%. All reported homeownership rate categories increased over the past five years except that of African Americans; which actually decreased. The financial crisis had a disproportionate negative impact on Black homeownership and in the recovery period Blacks continued to lose ground it their ability to build and or rebuild wealth through homeownership. NAACP and NID, through their national offices, will coordinate with their selected local NAACP Units and NID Branch offices to hold specific housing education and counseling events designed to empower Black families and urban communities with knowledge and assistance in the home mortgage lending and home buying processes. They will also co-sponsor events at NAACP National and State Conventions. Key components of the products and services participants will be educated on are local Down Payment and Closing Cost Assistance programs and improving credit scores to address the main barriers to purchasing a home, up-front cash and excellent credit. As well as how to analyze and manage a home loan and purchase as an economic and social investment. NAACP, founded in 1909, is the nation’s oldest, largest, and most widely recognized grassroots-based civil rights organization. The mission of the NAACP is to ensure that the political, educational, social, and economic equality of rights of all persons and to eliminate race-based discrimination. NID Housing, Oakland- based and founded in 1986, is the largest African American HUD Approved National Intermediary Organization in the nation. The NID mission is to work with its clients and partners in building communities where socially and economically diverse families and populations can live and prosper in a quality, safe and healthy environment.